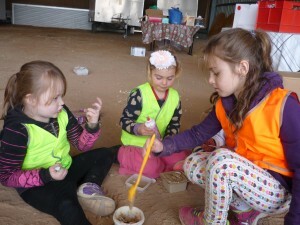 We had some more P-3 visitors from the school at Pop-up Play this week. 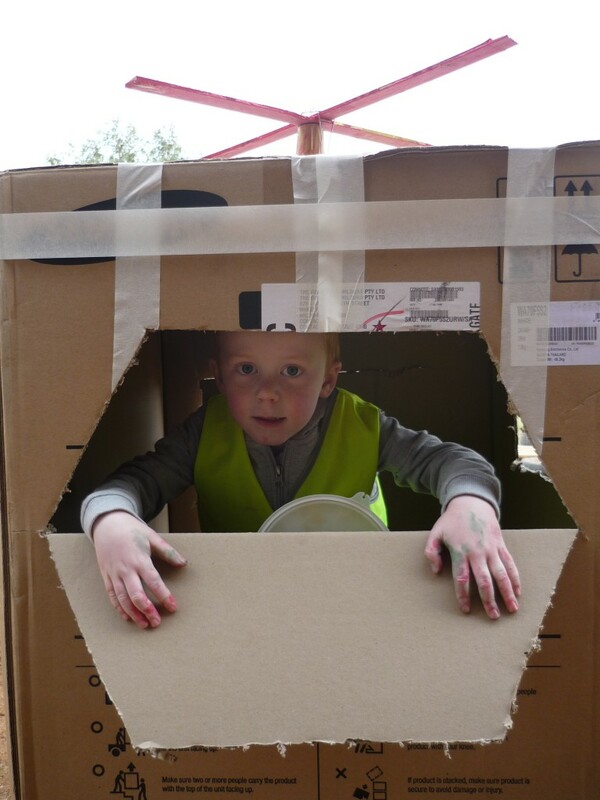 At Pop-up Play Jasper was hard at work making a box helicopter. 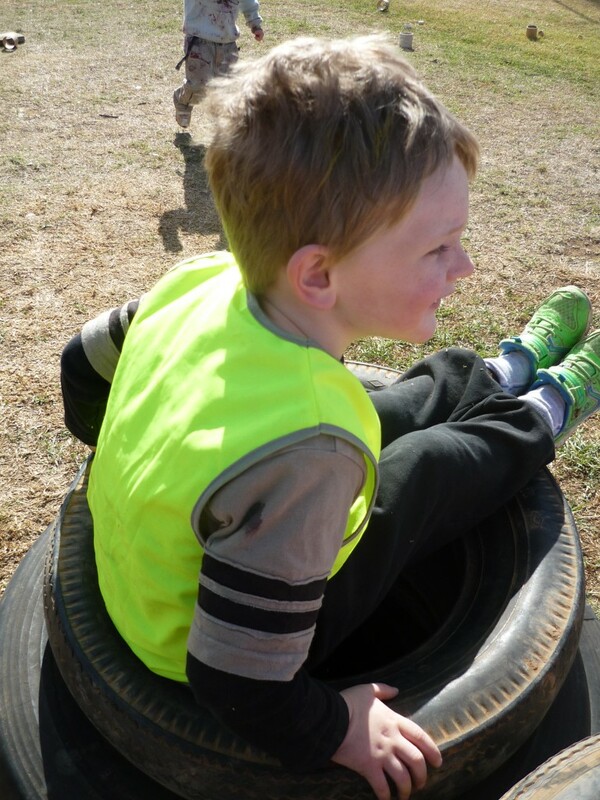 We made another obstacle course and a car…. 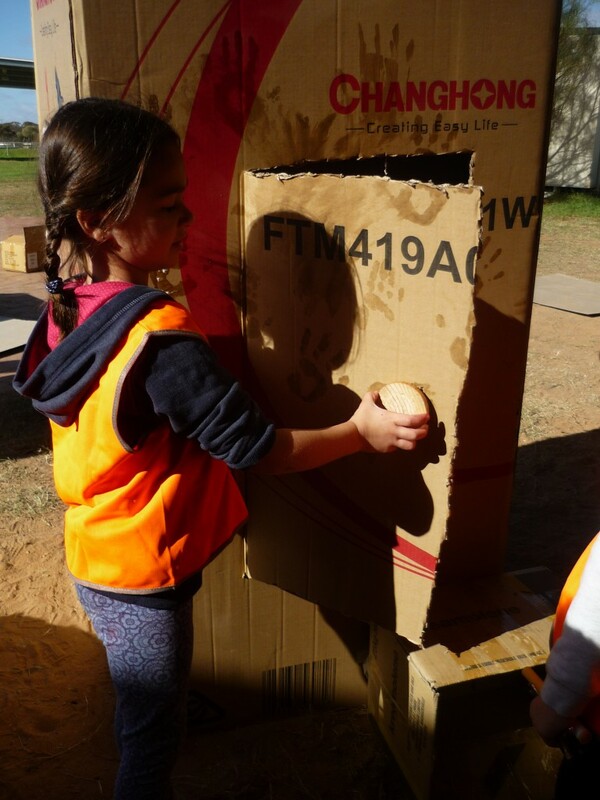 Boxes provided lots of fun…. Thank you to Mrs Vine who was a helper this week. 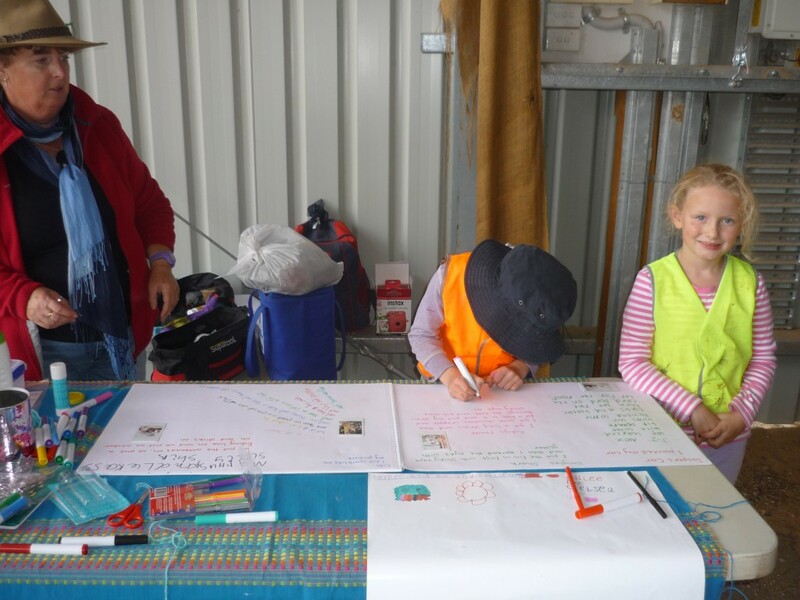 Thank you to the staff and students at Manangatang P-12 College who participated in this program. The decidious trees in our outdoor area are beautiful duing the Autumn. 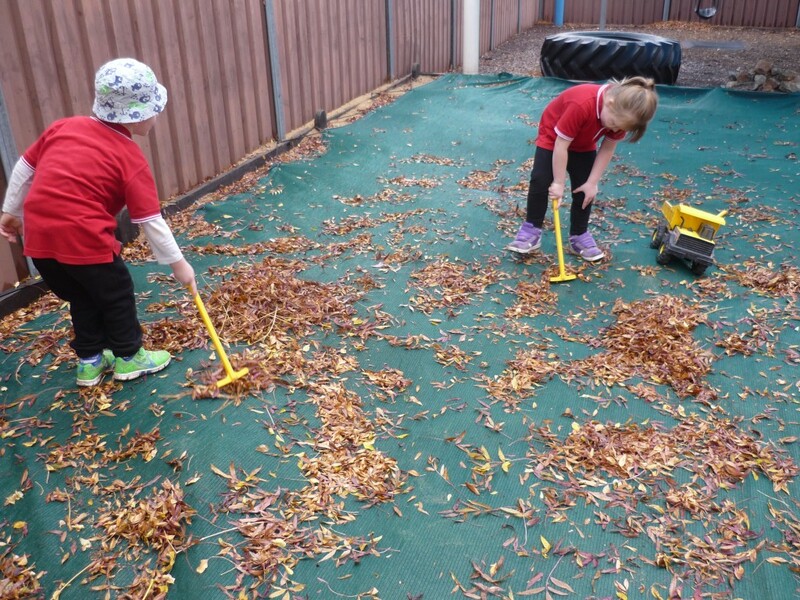 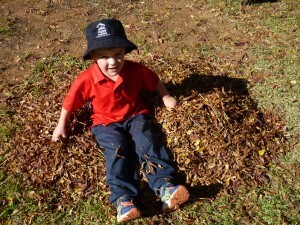 While the leaves have been falling for a few weeks – this week was the first week we had enough to rake and play with. 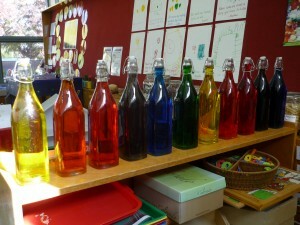 We have some glass bottles in the classroom filled with colored water. 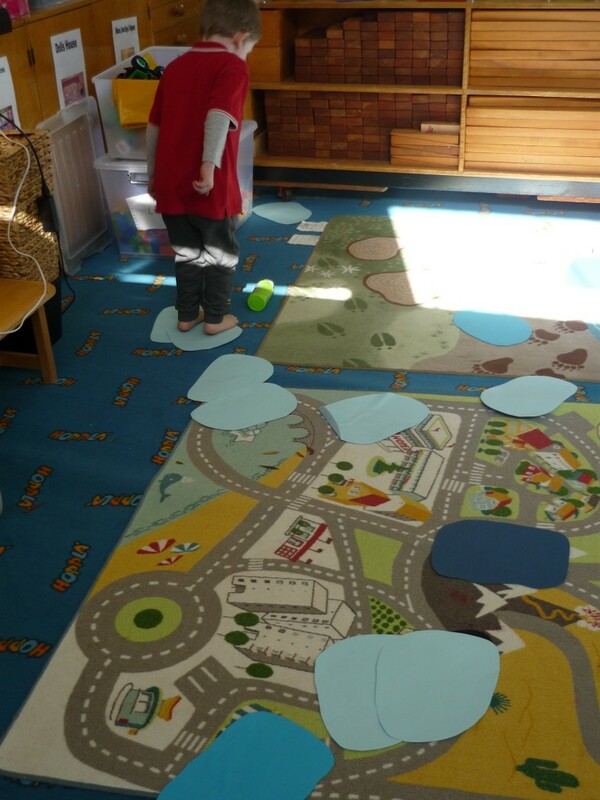 Today we must have had the bottles in the perfect position – because as the sun shone though the window we saw coloured reflection patterns on the floor. Mrs Gayle held a piece of white paper in place so we could see the reflections better. Mrs Grant kept moving the bottles so we could see different colours. 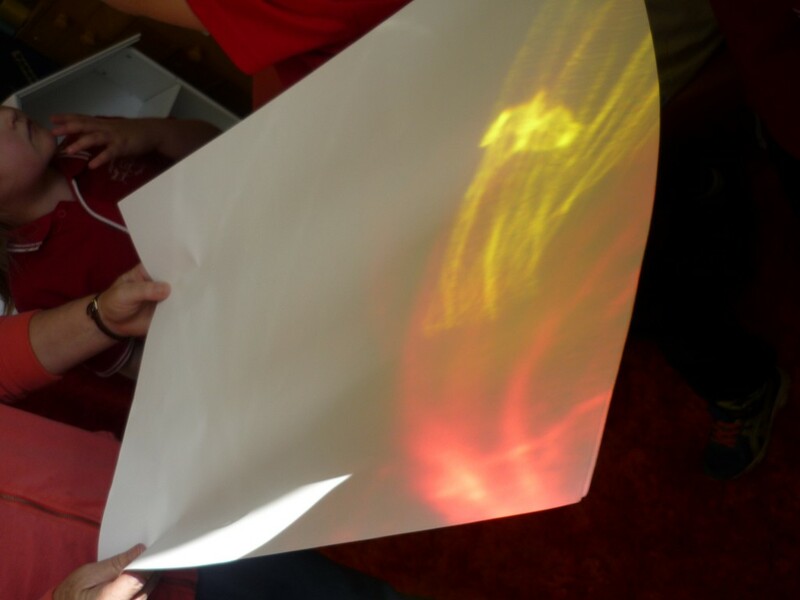 We had to be careful not to make a shadow in the paper. 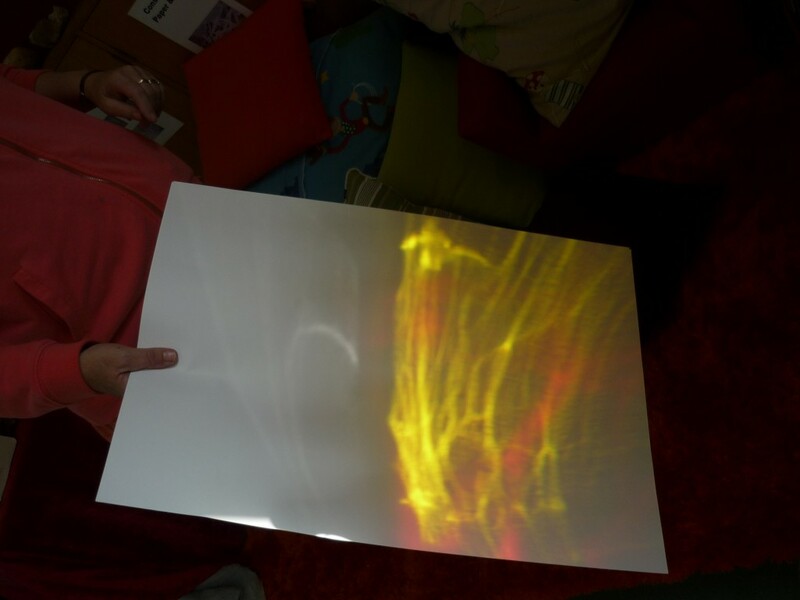 Then we played with the light box. 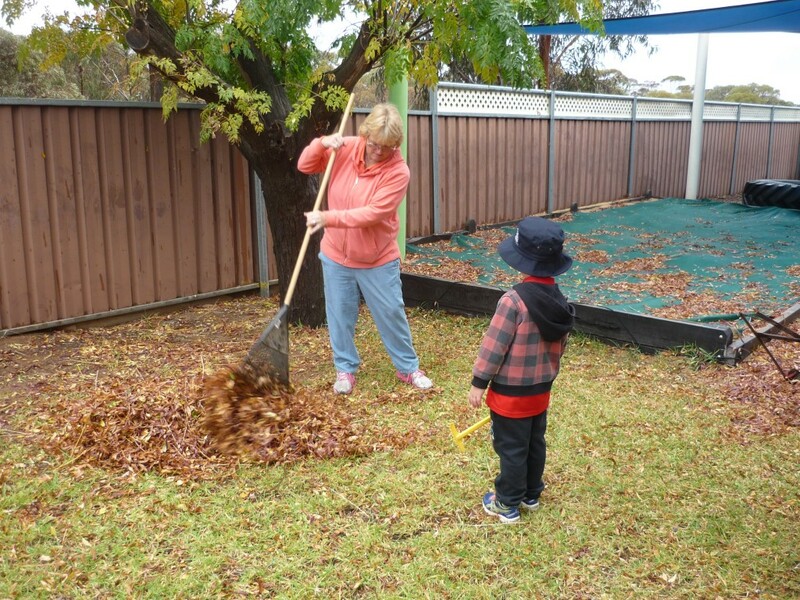 We celebrated with a few activities and stories. We made collage. First we made rainbows using cotton balls to rub on dry powder paint. 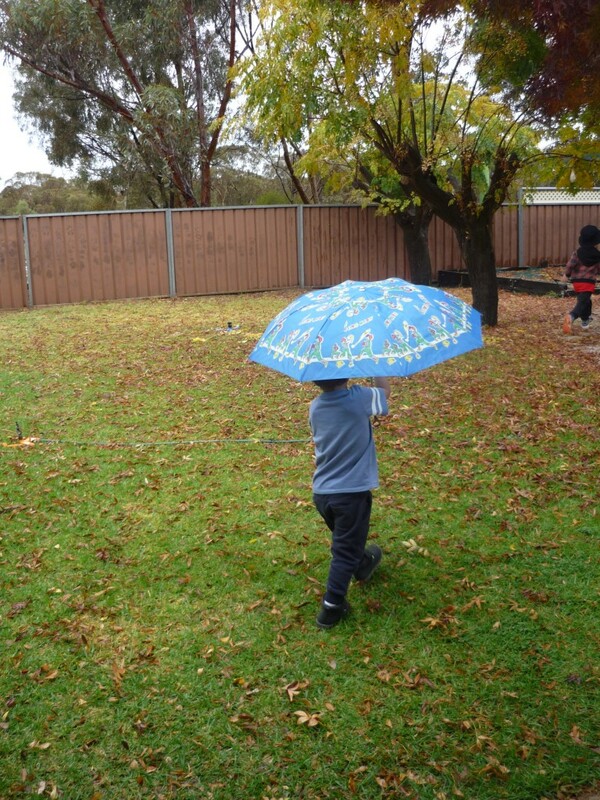 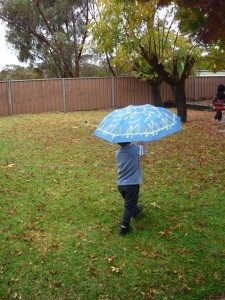 The we mixed two parts PVA and one part water with a few drops of blue food colouring to make the rain. 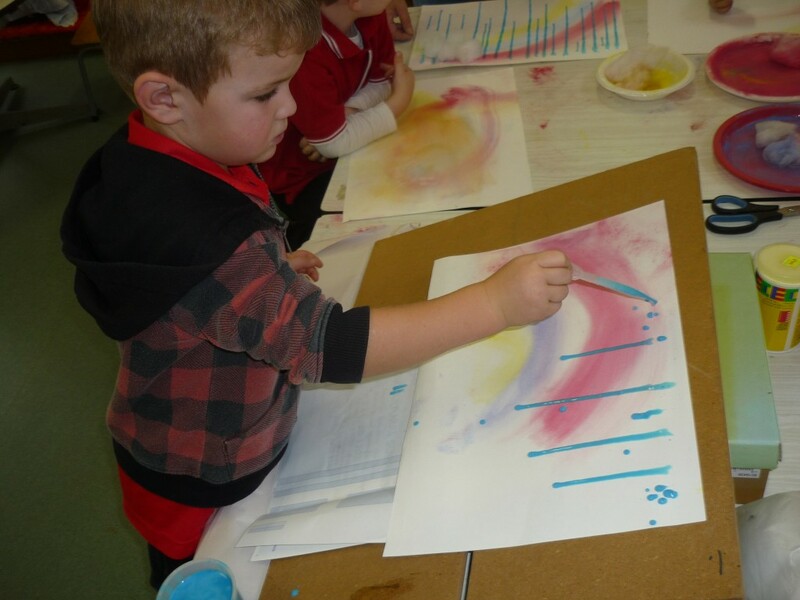 We put our pictures on a 45 degree angle and dropped ‘rain’ at the top of the page and watched it run to the bottom of the page to create the rain. 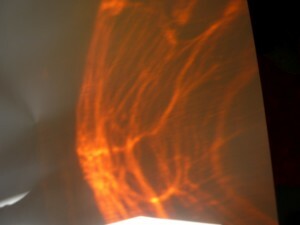 Then we stuck on a few cottonball clouds. The children were really concentrating while using the droppers. 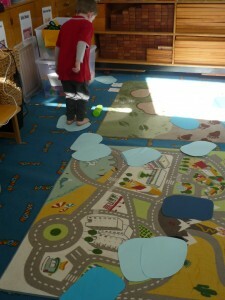 We put cardboard ‘puddles’ on the floor for the children to jump in – once again practicing our jumping and leaping. Then we made ‘rainsticks’ from decorated cardboard tubes and rice. 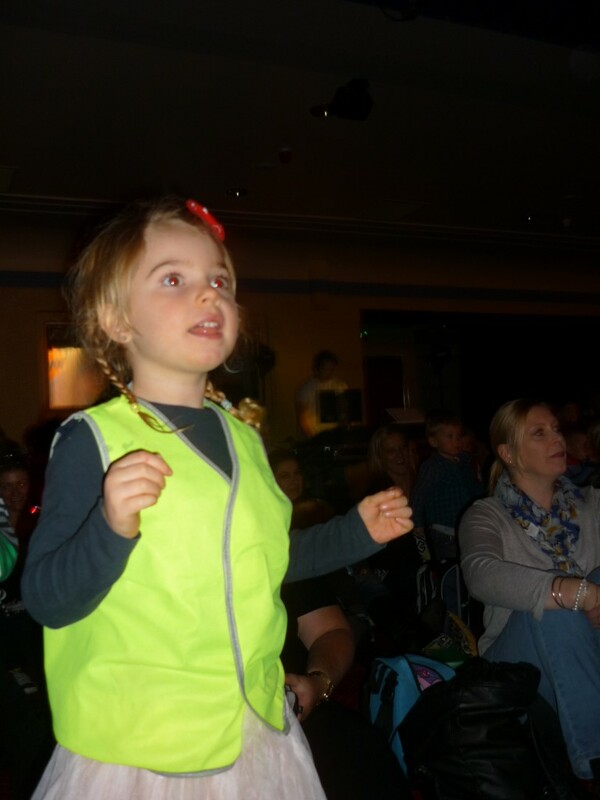 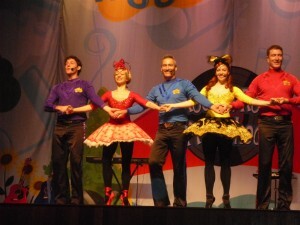 On Tuesday we went to Swan Hill to see the Wiggles. Rock-a-bye-Your Bear is one of this years children’s favourite songs. 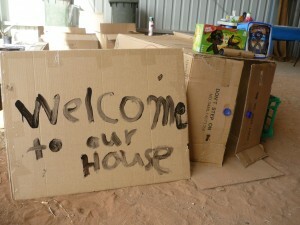 Entering the hall with so many children was an overwhelming experience for our children in the beginning. Towards the end of the concert many of the children were joining in. 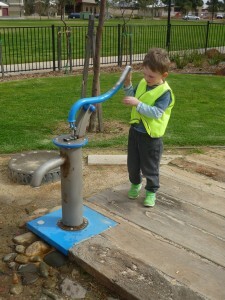 After the concert we went to the sensory park at Tower Hill for a play and lunch. 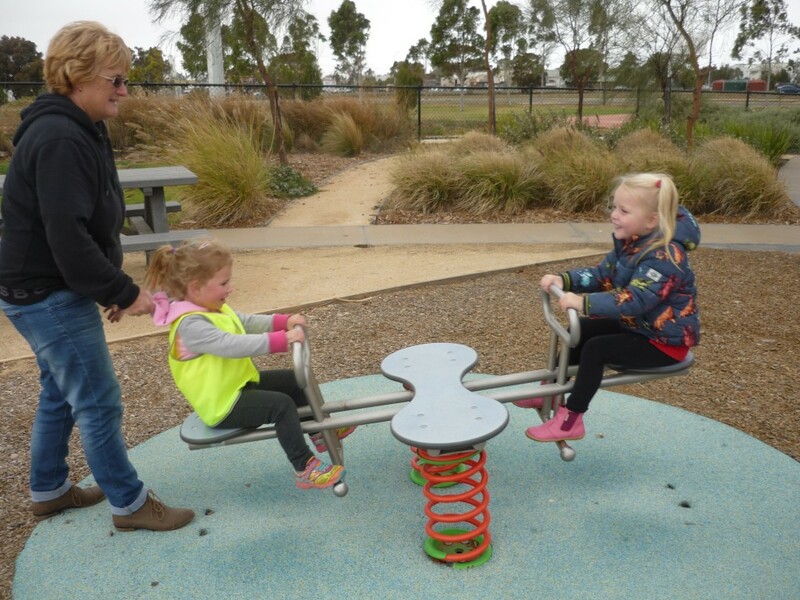 This is an amazing park and resource for the community. 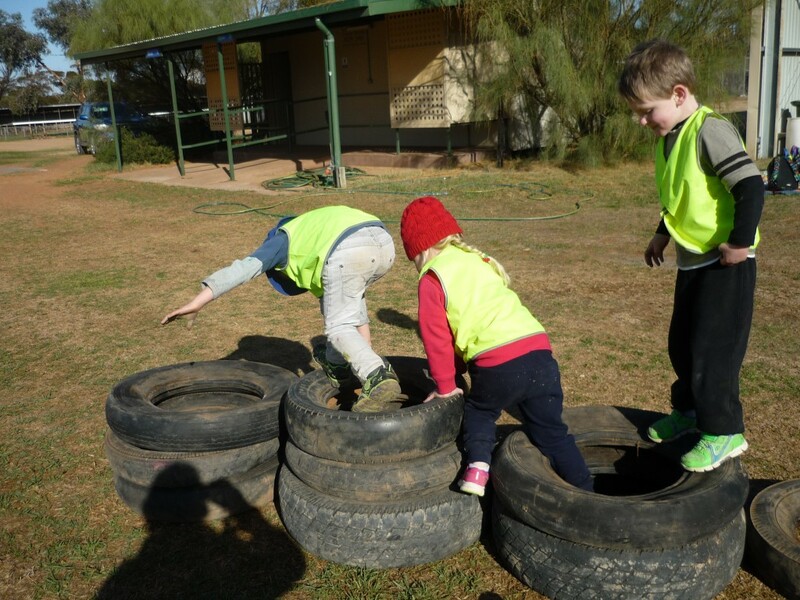 At Pop-up Adventure Play today the tyres and planks of wood were the main focus of play. 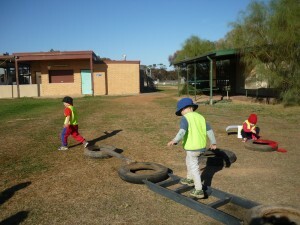 The children made an obstacle course. 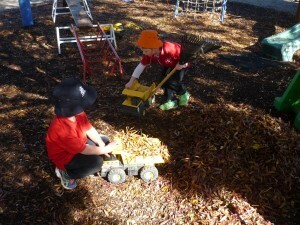 Darcy said, “If you don’t help build it, then you can’t play.” The children accepted this rule. Mrs Jones and Mrs Plant we at the Rec Reserve for a walk and they came to visit. 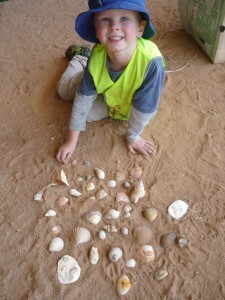 The other play revolved around a box of shells. The girls started pasting them on a piece of cardboard. 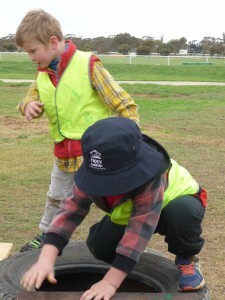 The boys decide they wer pirate treasure and so a game followed. The pirates stole the treasure for themselves. 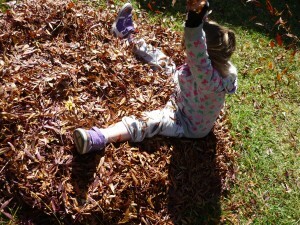 And finally we played hide and seek. The children hid in stacked up tyres. While this is not really applicable to our service as we do not have a facebook page and all our BLOG comments are approved by me before posting – it is important for your general information. Today was our first week of Pop-up Adventure Play. 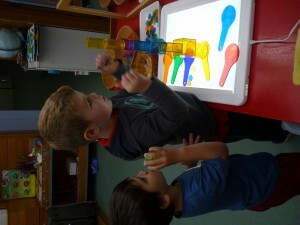 We were learning all about it and so were the children. 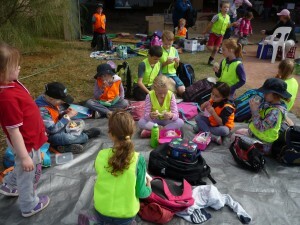 This week the first group of P-3 Children from the school joined us. 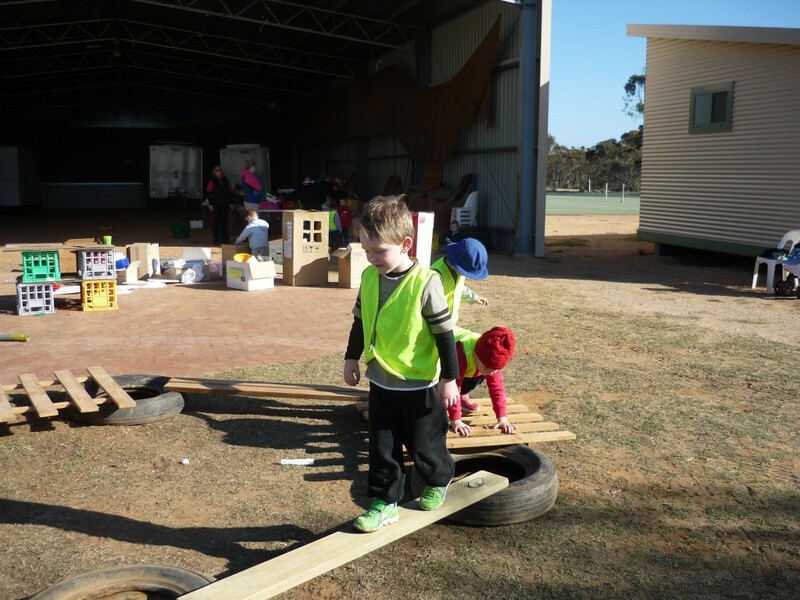 It was great having the older children who showed the Pre Schoolers the ‘possibilities’ with all the recycled materials provided. Lots of children made cars. 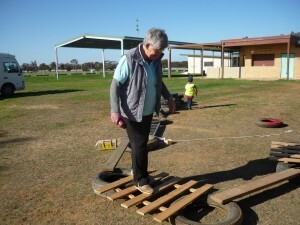 Some were attached with string and the children ran around with these. 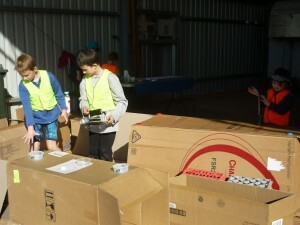 Cars also featured steering wheels, tyres and helmets. 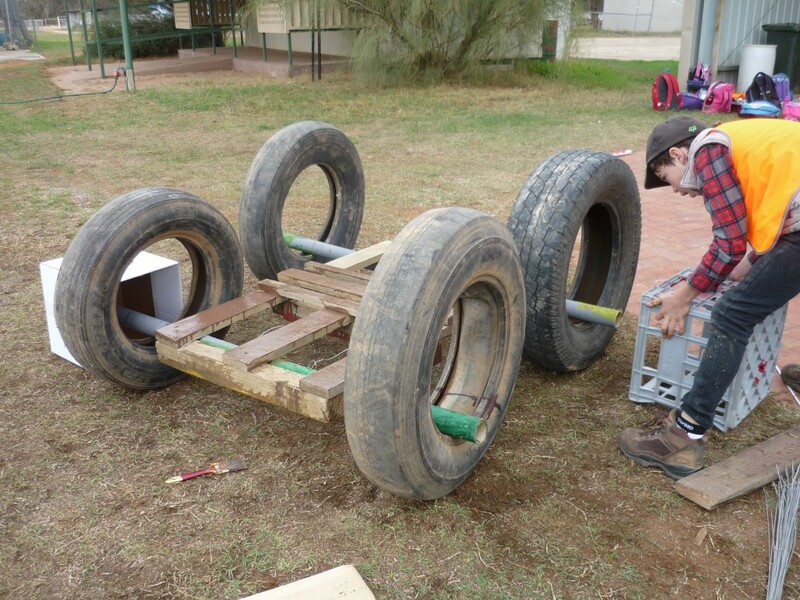 Anders, Marie and Co spent all day making a billy cart with wood and tyres – showing some great persistence. 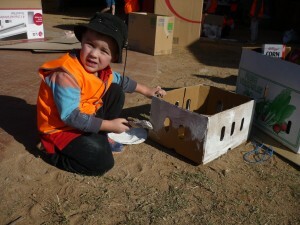 There were lots of houses made. The girl’s houses had lots of decorations and some of the girls made dogs and a kennel. Hailee gave her neighbours food! 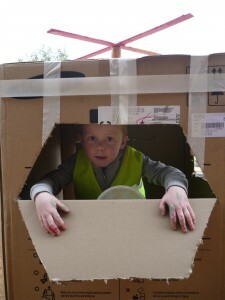 Alex and Jay Jay connected lots of boxes for their house. The Pre schoolers had fun in here until it collapsed! 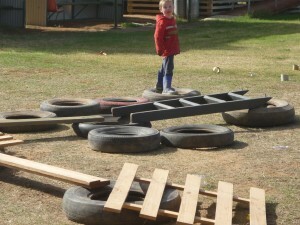 One group of children made a ship. Lots of little things were made. 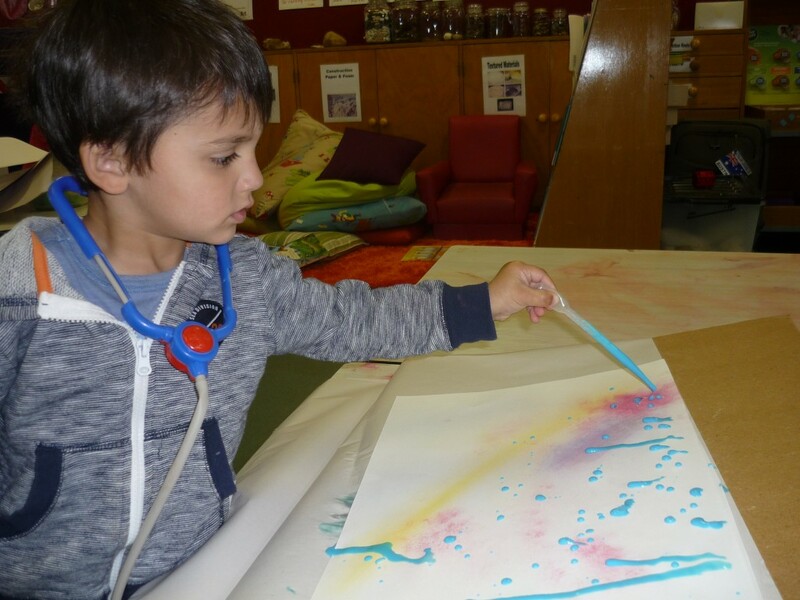 Paintings and college, a table set up with plates, seats and serviettes, a pig and a shark – just to name a few. 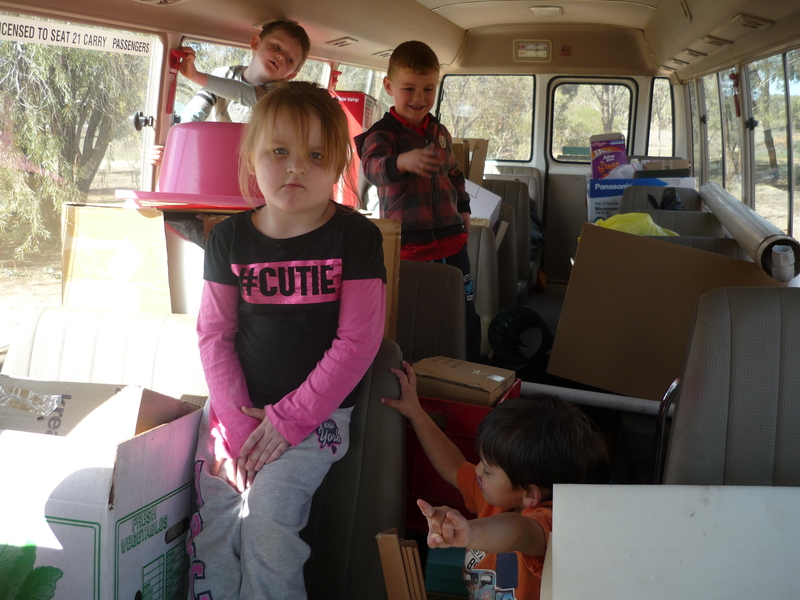 Ann Grant was in charge of our recording table. She assisted the children to fill out their experiences in our “Thinking, Talking Floorbook”. A great day was had by all and many children went home with their special creations. 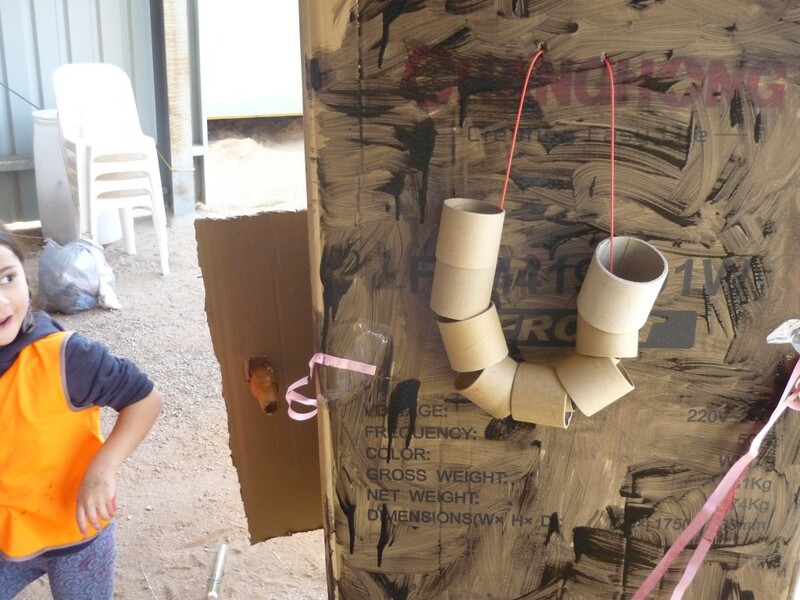 It’s amazing what can be created with ‘junk’. 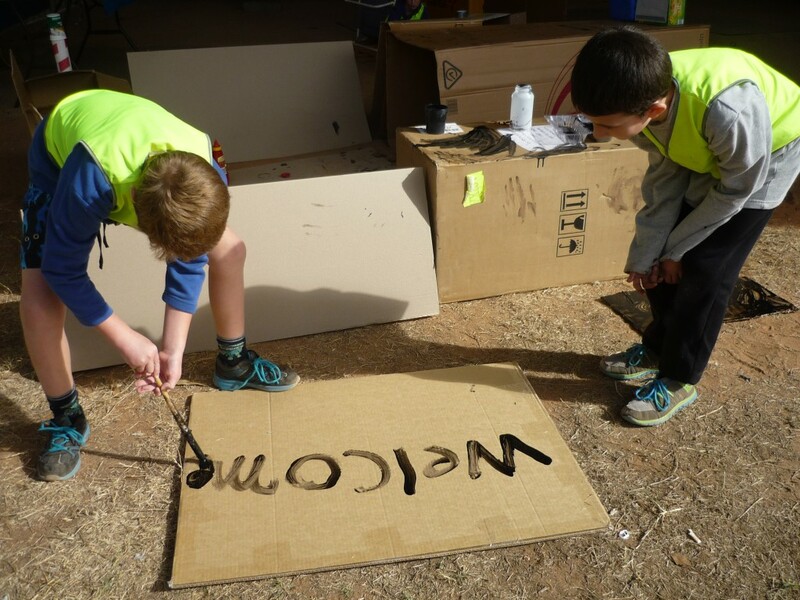 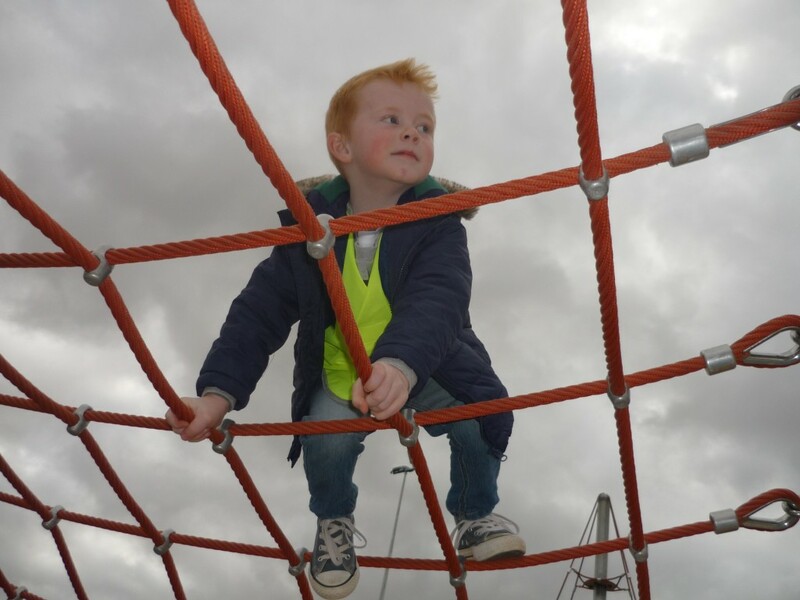 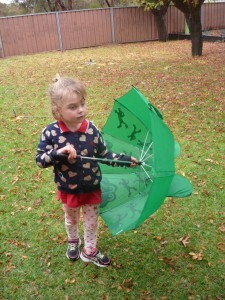 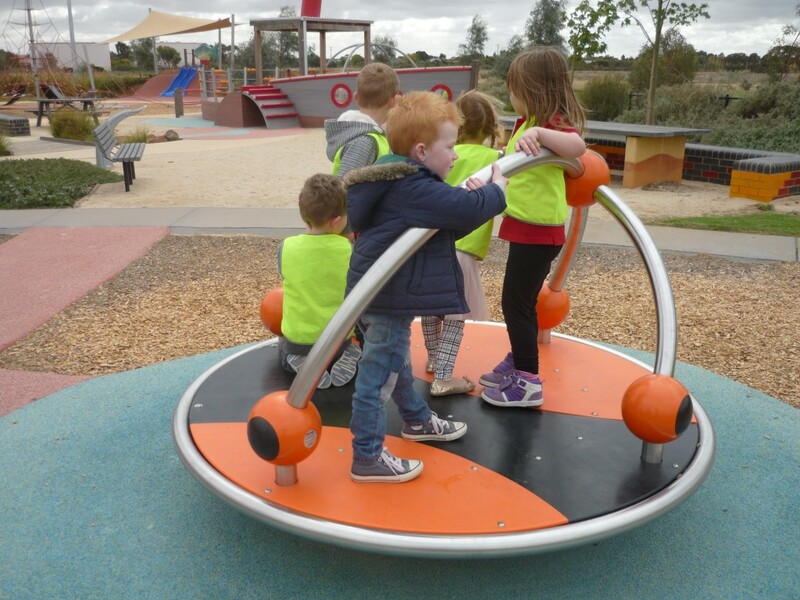 This week we are going into a public space (the local Recreation Reserve) and setting up a POP-UP ADVENTURE PLAY. 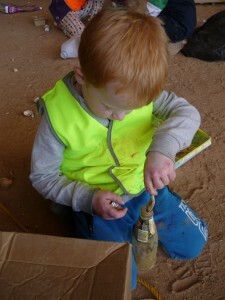 We have been collecting re-cycled materials and tomorrow we are going to have fun creating with them. 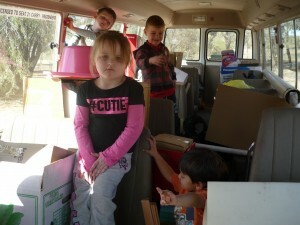 I am a big believer in the children helping with set up and pack up and this forms and improtant part of our program. 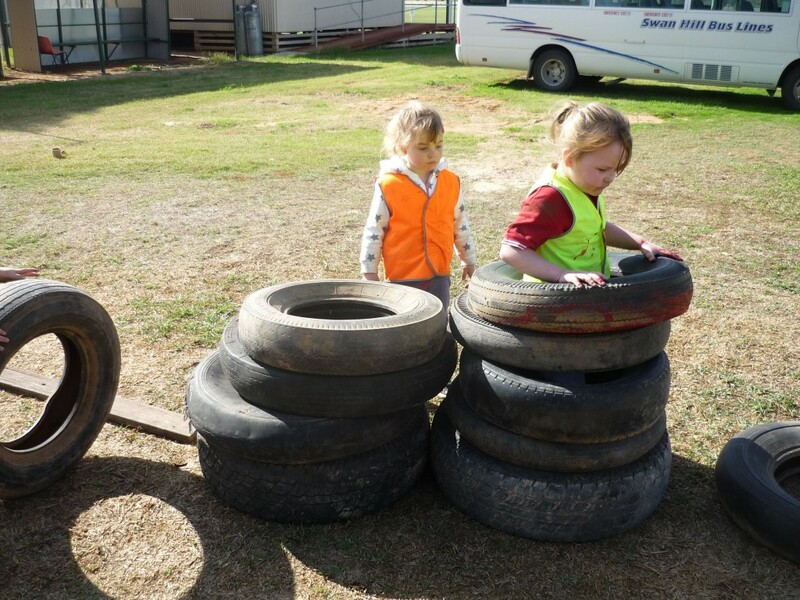 Today the children had to help the teachers pack all of the materials into Mrs Grant’s car and Mrs Gayle’s Bus to be tannsported to our POP-UP PLAY Space. Each Thursday for the next four weeks we will play/create with a variety of materials. 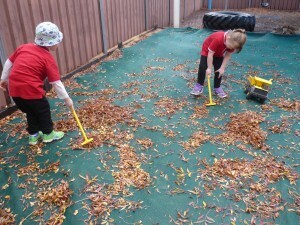 We have invited the school children and Sea lake Pre school to visit us during this time. This will help us learn to work with others and form relationships. Stay posted for further news. 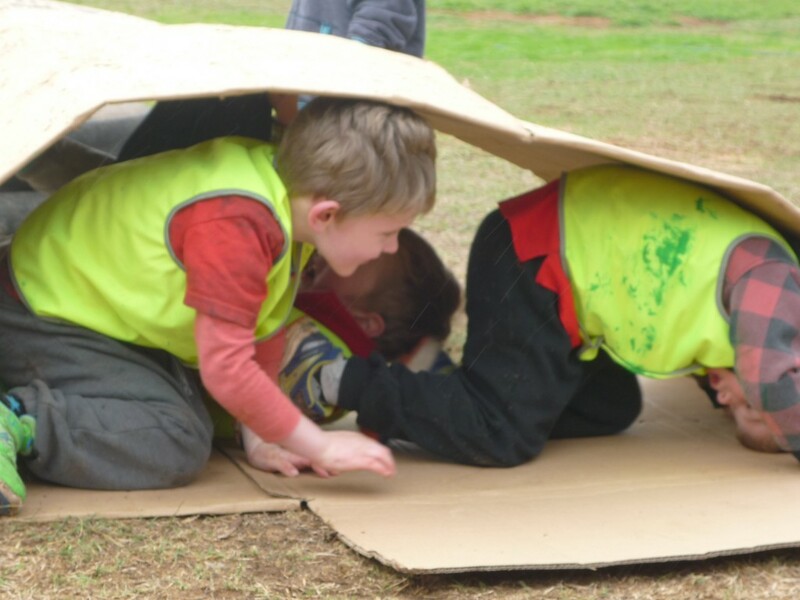 Pop-Up Adventure Play is a movement that originated across the UK and we are bringing it to Manangatang. 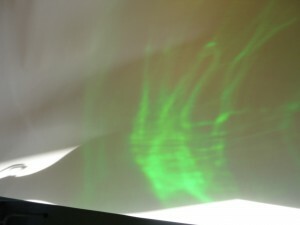 You can follow the links for more information by clicking on the above logo. 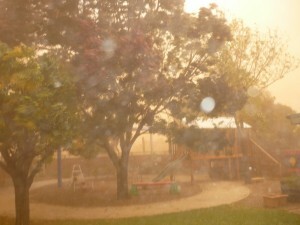 This week we had a very bad dust storm. 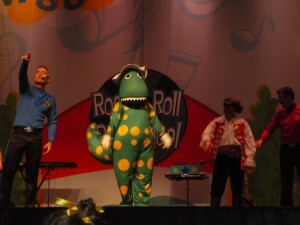 Here is a photo for our followers who missed this amazing (but terrible) event. 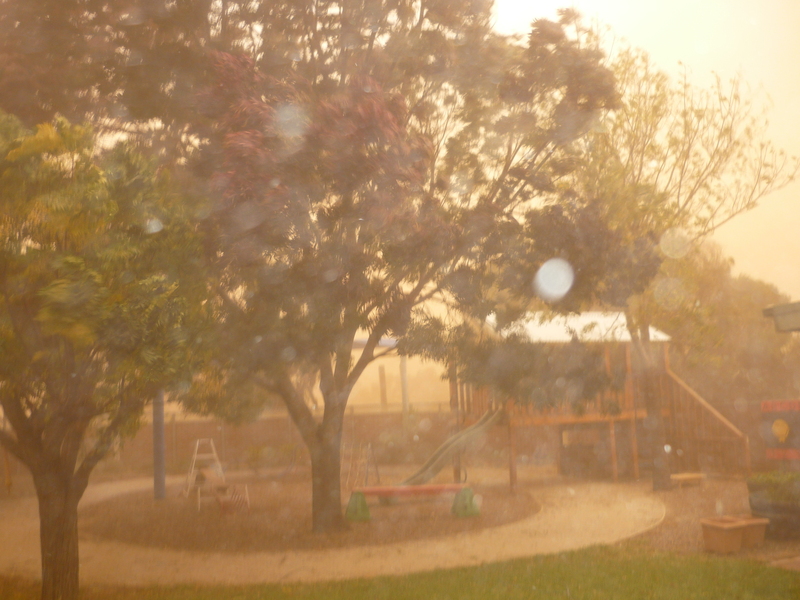 Needless to say we didn’t go outside to play today. Instead we went into the Playgroup Room and put all the cushions into a ring on the floor. Then we moved to the Rock Ed One Movement CD aroung the circle. 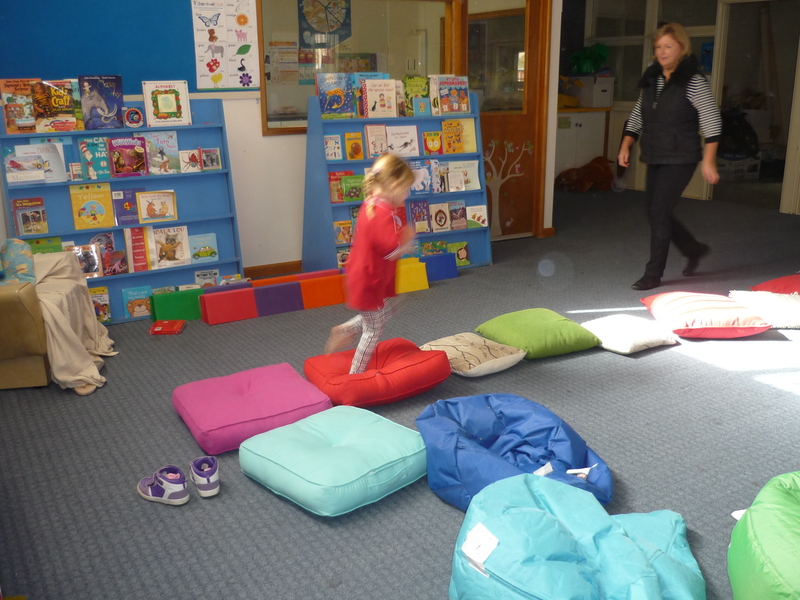 The idea of the cushions is to make keeping our balance harder – therefore improving our core muscles when our bodies had to keep readjusting to stay balanced. 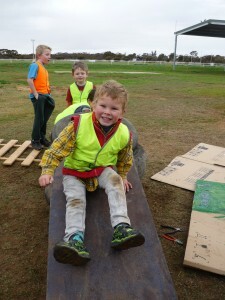 It is also physically exhausting.